This edition focuses on Shoot’s 1993 FA Cup Final review edition, which unfortunately for them, required a replay to be played on the date of publishing. The cover stars are Paul Warhurst and Ian Wright battling for possession in the original game. A report of the FA Cup Final gets a double page spread. In rumours which look silly now : Barnsley want Gordon Strachan to be their manager, and Manchester United are going to sign David Platt, Stuart Pearce, David Hirst and Roy Keane. Aston Villa apparantly want to sign Stan Collymore. They did, four years later, after he had spells at Nottingham Forest and Liverpool. 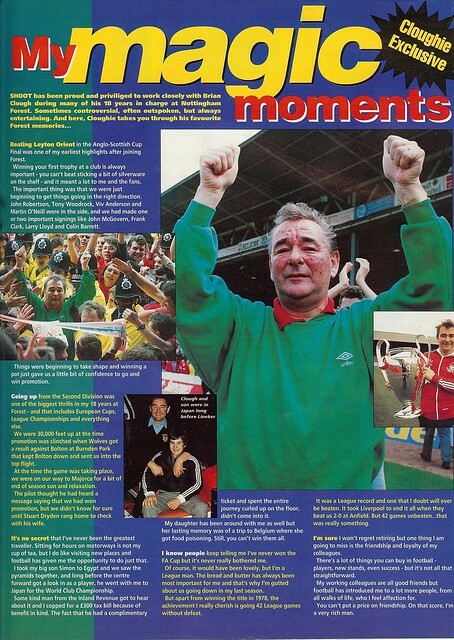 Brian Clough marks his retirement with an exclusive interview, which gets a page dedicated to it. Aldershot Town get a page dedicated to them. 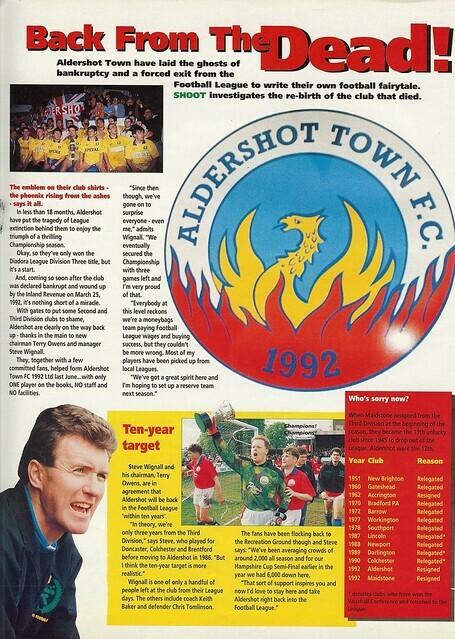 Founded in 1992 from the ashes of Aldershot FC, they were started again in the bottom tier of English football. Manager Steve Wignall said the club have a realistic ambition of being a Football League club again by 2003. They did make it back to the Football League, but not until 2008. Jimmy Greaves letters page is as crazy as ever. Ashley Ballhatchet from Farnham Common cheerleads for Julian Dicks getting into the England squad. John Richards from Sunderland is unimpressed by the idea of Sunderland leaving Roker Park to a new 40,000 all seater stadium. 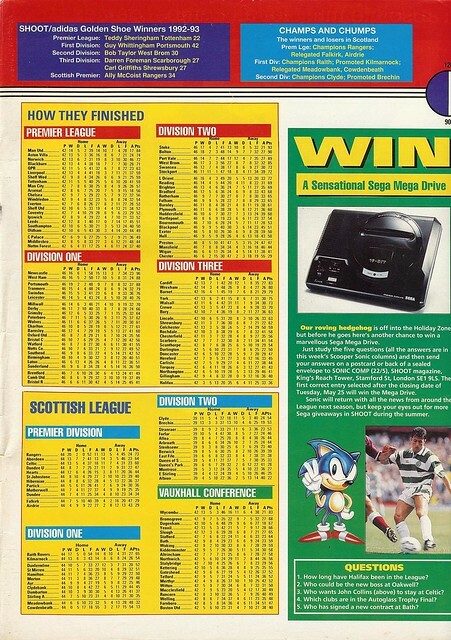 Meanwhile, with qualification for the 1994 World Cup looking unlikely, the plight of Scottish football gets a double page spread. Scotland ended up qualifying for Euro 96 and France 98, but nothing since. With Manchester United winning their first title in 26 years, long serving captain Bryan Robson gets a double page spread about his delight at this. It was a good year for Welsh football. With the national team making a serious bid for World Cup qualification (they eventually lost out in the final game), Cardiff City and Wrexham were promoted from Division and Swansea City reached the Division Two play-offs. This entry was posted in Football, Magazine Archive and tagged 1993, Aldershot Town, Arsenal, Aston Villa, Barnsley, Bolton Wanderers, Brian Clough, Bryan Robson, Cardiff City, David Hirst, David Platt, FA Cup, Football, Fulham, Gordon Strachan, Ian Wright, Jimmy Greaves, Julian Dicks, Magazine Archive, Manchester United, Nottingham Forest, Paul Warhurst, Roker Park, Roy Keane, Scotland, Sheffield Wednesday, Shoot, Stadium Of Light, Stan Collymore, Stoke City, Stuart Pearce, Sunderland, Swansea City, Wales, West Bromwich Albion, Wigan Athletic, Wrexham. Bookmark the permalink.